Cases purported to be for Apple's next-generation iPad that were posted to a Chinese trade site are being removed after the site received a "legitimate takedown request," possibly lending credence to their authenticity, according to a new report. Earlier this week, international business-to-business trading site Alibaba.com received a request to remove the case listings, The Wall Street Journal reports. We do not know whether these products are what they say they are, but we have received a legitimate takedown request and are removing the listings, Alibaba Group spokesman John Spelich told the Journal, though he declined to comment on the source of the request. Early this month, cases allegedly for the second-generation iPad with space for a rear-facing camera and a mysterious cutout on the bottom near the speaker were spotted online. After a Japanese Mac blog posted a report that the next-generation of Apple's successful tablet device would have a flat back and wide-range speaker, leaked cases advertised as for the "iPad 2" were discovered on Alibaba.com with illustrations of an enlarged speaker grille on the back of the device. According to the Journal report, several listings for the case had been taken down by Friday, though at least two remained as of Friday afternoon in Beijing. Spelich said the company is working on removing all the listings. A man who answered the phone for one of the case suppliers contacted by the Journal said that his company works with Apple manufacturer Hon Hai Precision Industry and possesses first hand material on the features of the new iPad, calling the case design "extremely accurate." The man declined to give his name, saying the matter was "very serious." Hon Hai spokespeople denied connections between the company and the Alibaba.com case listings and called the case supplier's remarks "hostile." Reports of the second-generation iPad have gained momentum as of late. Earlier this week, one industry insider suggested that the upcoming tablet will include a USB port. 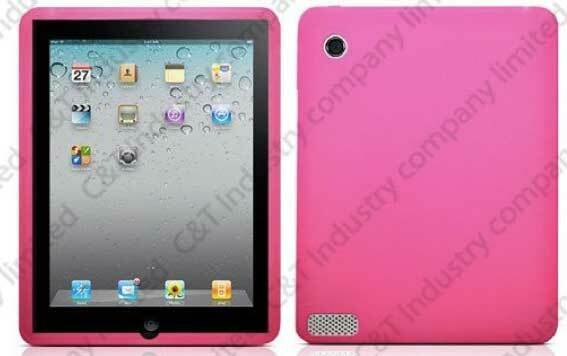 Another report suggested that Apple plans to build Wi-Fi, UMTS and CDMA models of the next iPad.